Having some lightweight wind protection on hand is invaluable for unexpected weather or a prolonged descent. Pearl Izumi's P.R.O. Pursuit Wind Jacket is windproof, water-resistant, and packs down easily so you won't have any qualms about bringing it along in your jersey pocket. Softshell Lite fabric offers form-fitting stretch, and combined with a small mesh back panel and full-length zipper, provides excellent breathability while keeping out the chill. Cut with an offset hem and sleeves, the P.R.O. 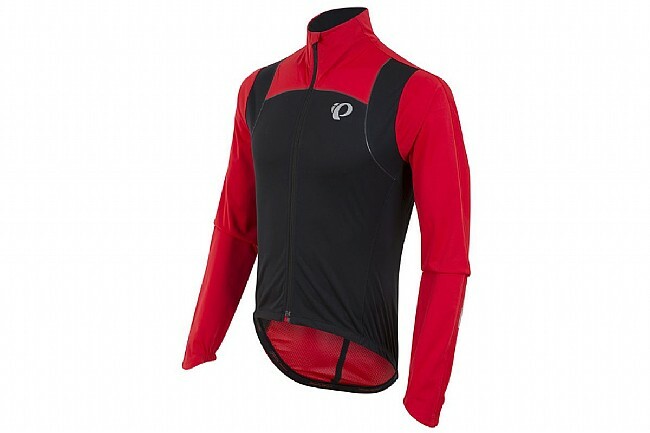 Pursuit Wind Jacket gives you excellent coverage whether riding on the hoods or in the drops. Features reflective elements for increased low-light visibility. Available in multiple colors. Form fit.